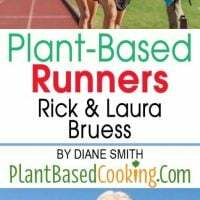 There’s a myth that competitive athletes need meat and dairy to succeed, but according to long-time plant-based athletes, competitive runners Rick and Laura Bruess of Boulder, Colorado, nothing could be further from the truth. Rick, 58, and Laura, 57, told Plant-Based Cooking recently that they’re in good health and take no medications. Laura’s athletic achievements, fueled by nothing but plants and plant-based foods, speak for themselves. For women her age, Laura holds five current American records for 10,000m, 15,000m, 20,000m, 25,000m and 10mile races, the Mid-America Indoor and Colorado Records for 1500m and 3000m, and the Outdoor Record for the 3000m and the mile. In 2017, she was the National 10K road race champion, and in 2016, the National Indoor Champion for the 1500m and 3000m. She won the 10,000m silver medal at the 2012 World Championships, holds the all-time Bolder Boulder record for 55-year-old women and won the Boulder Backroads Marathon three times. During the first hour of the USATF (USA Track & Field) Championship 25,000m race in Oregon in September, 2017, Laura achieved the national one hour record, which is based on distance rather than time. She held that record briefly until another female runner bested her by just 73 meters. “Now I want it back!” she said. Laura hopes to regain the one-hour national record at the USATF (USA Track & Field) New England Hour Run Masters Invitational in Massachusetts in September. 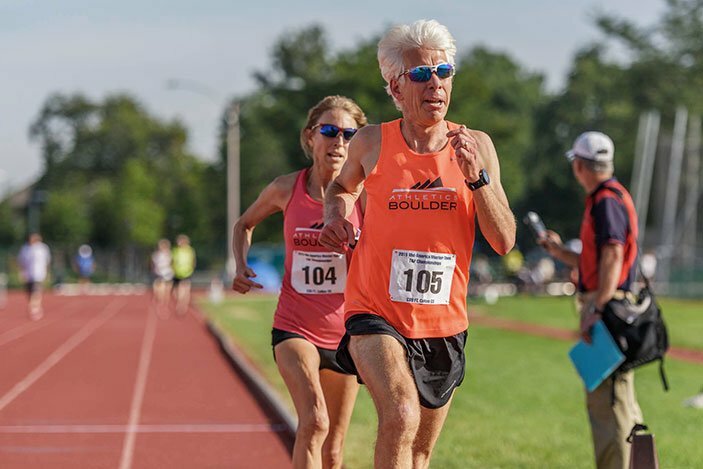 At the Bolder Boulder in May, Laura hopes to claim the all-time record for 57-year-old women at that race, now in its fortieth year. Rick, Laura’s husband of 33 years and running coach, deflected Laura’s praise for his coaching by attributing her success to diet. “I think most of her good racing has come since she’s been vegan,” he said. 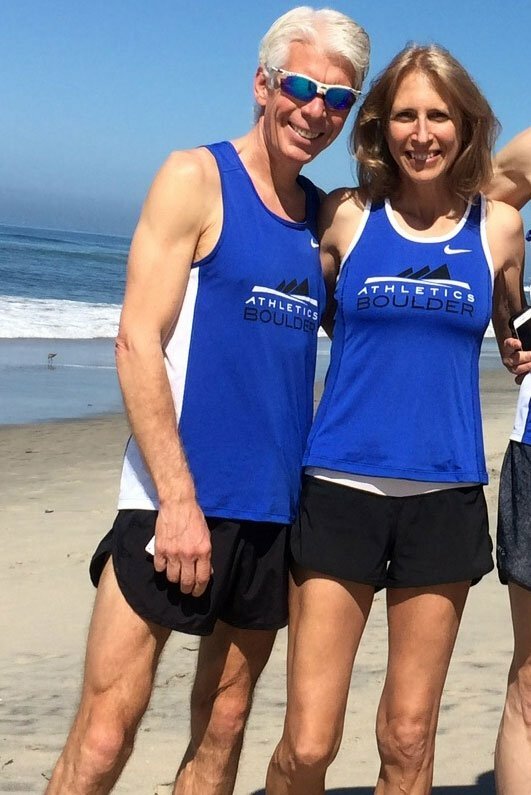 Rick also coaches the running club that the couple belongs to, Athletics Boulder. The club’s 50+ women’s team won the 2014 USATF (USA Track and Field) Cross Country Nationals. Rick competes at USATF events and has likewise noticed improvements in his own running since going vegan. “I think that recovery is quicker after hard workouts and races. I think in general we just felt better after becoming vegan, especially after giving up eggs,” Rick said. The retired couple runs every day on the trails and dirt roads surrounding the Boulder Reservoir. Laura runs 60 miles per week, while Rick runs 70-75 miles per week. They have never felt better. Laura found that her irritable bowel syndrome and yeast infections went away after eliminating eggs. For Rick, a plant-based super smoothie (stay tuned for next week’s article) that he developed based on extensive nutritional research has apparently greatly improved a nerve injury in his left leg. The couple also feels good about the many environmental benefits of their vegan lifestyle. The times are definitely changing when it comes to vegan athletes, with movies like the recently-released documentary “The Game Changers” chronicling the success of professional vegan athletes at the highest levels of competition. 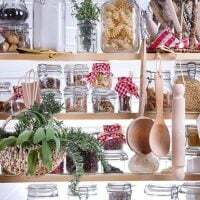 Public perception of vegetarianism and veganism is different today than it was decades ago when the couple first became lacto-ovo vegetarians who ate dairy and eggs but no meat, poultry or fish. At the time, they recall, dietary health misinformation was pervasive. “Thirty years ago, we were told that our health was going to get worse from becoming vegetarians. I didn’t care,” Laura said. Rick, who followed Laura’s lead down the vegetarian path, said he never believed the negative predictions. For Laura, it was all about the animals. “It just dawned on me what a hypocrite I was being that I said I loved animals. It was a particular moment when I’d seen a baby cow alone in a field earlier that day, and then my boss said to me that the cow’s going to die. I felt so sad, but at lunch there I was eating a Sonic burger. I realized that what was I doing didn’t make any sense,” Laura said. The couple went plant-based vegan about 15 years ago, and try to follow Dr. Michael Greger’s dietary guidelines. 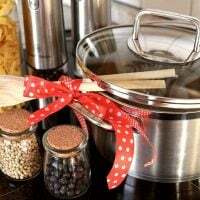 They are oil and salt-free (with the exception, Laura confessed, of the olive-oil popped popcorn they eat at home once a week during football season). Every morning for breakfast Rick and Laura have the Superfood Smoothie. They snack during the day on a nut mixture and fruit. 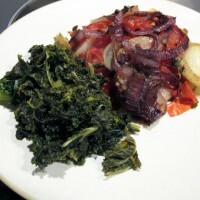 For their late lunch, it’s typically kale chips, baked sweet potato, and tofu (see recipe below). 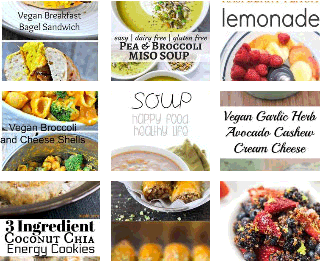 And for dinner, the couple dines on a rotation of soup, chili, stir-fry, pizza, burritos and vegan burgers, and they eat black beans with almost every meal. Laura drinks soy and almond milk, and they both drink wine or beer four days per week and have two cups of coffee every morning. For dessert, it’s a Clif Bar, Lara Bar, or some dark chocolate. “Once we got away from the things like cheese, you look at them now and you think that they look terrible, unappealing,” Rick said. “You think you’re going to miss out, you think you’re going to miss this and that, and then after a while, you don’t even want it,” Laura said. Rick said that the couple has not had any issues with hunger, and in fact, that according to plant-based experts, the more nutrient-dense the foods you eat, the less hungry you will be as the body gets what it needs. Even the couple’s seven-year-old dogs Benny and Joey are vegan. The dogs are thriving, Rick and Laura said, on the Evolution Diet they order online. I’m a little concerned about putting this in as dogs are carnivores, but I know other people who have vegan dogs. I think it might take too much explanation. Maybe save it for the next article and we can think about how to write it. “The dogs love it and they’re super healthy. When we rescued them, they were emaciated, their coats were like straw. We put them on this vegan diet and their coats are soft and silky, completely changed, not even the same color that they were,” Laura said. Seems like a plant-based diet is working well for the whole Bruess family. 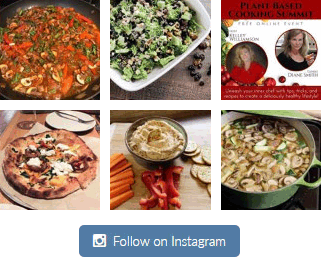 If you’d like to share your plant-based success story with Diane at Plant-Based Cooking, send her a note, diane@plantbasedcooking.com.